The incomparable Peter Lovesey has been awarded just about every crime prize, including The Lifetime Achievement Award from Strand Magazine, CWA Silver and Gold Daggers, and the Cartier Diamond Dagger for Lifetime Achievement–and he shows no signs of slowing down. 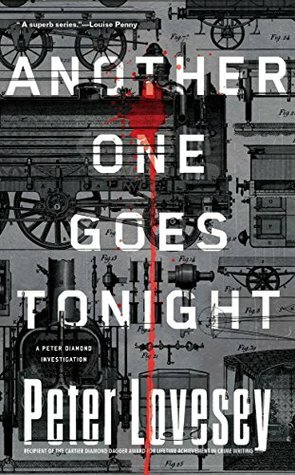 He’s back with his 16th Peter Diamond mystery, Another One Goes Tonight,, with the unflappable Bath detective up to his usual tricks. Tasked with representing Professional Standards after an accident involving two police officers, one of whom dies at the scene, he discovers the body of an elderly victim of the crash, thrown into bushes at the side of the road. He saves the mans life with his quick CPR, and while investigating the incident, hoping the clear the police driver of fault, Diamond soon becomes convinced that the elderly engineer, still in hospital, is a serial killer. It’s a fascinating premise as he tries to puzzle out what really happened that early morning between the police car and the elder out on his motorized bike. Most of what he uncovers is a by-product of his investigation and inadmissible. Soon he’s enlisted two of his team members to help him in this side investigation, with very interesting results as they uncover a trail of deaths of elderly people within the past two years who were known to the hospitalized engineer. Readers will learn about the almost fanatical love some people had for steam engines, collecting memorabilia from their favorite branch and even assigning estates to the National Railway Museum. But could this love of a bygone era also be the tie to a string of murders? As well-plotted and crafty as always, with that hint of wry wit mixed into a police procedural. The most clever of puzzles with a highly satisfying ending.